Like the other services, the Navy offers enlistment bonus incentives to encourage applicants to join. The value of incentives can vary, and they're usually not open to every rating (the Navy's word for a job). Typically wherever the Navy has a shortage of personnel or anticipates a need for a particular area will be the areas where bonuses are offered. There are career bonuses for remaining in a high-demand, underpopulated Navy rating as well. Most of the Navy's bonuses can be combined, so if you're fluent in a language the Navy needs and you sign up for a job that offers its own specific bonus, you may be able to collect two bonuses. To qualify for most of the Navy's bonuses, recruits have to agree to longer active duty enlistment contracts, usually adding a year. Some programs which require five or six-year enlistment periods don't require enlistment extensions to qualify for bonuses. Here are some of the bonuses available to new recruits as enlistment incentives. Sailors who demonstrate proficiency in a critical language can earn a bonus of up to $12,000. To qualify, the sailor must score at least 2.2 on the Defense Language Proficiency Test (DLPT), prior to graduating basic training. 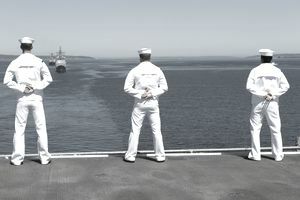 Usually, the sailor must enlist in one of the following ratings: builder (BU), construction electrician (CE), construction mechanic (CM), engineering aide (EA), equipment operator (EO), worker (SW), utilities man (UT), or hospital corpsman (HM). All of these require a five-year enlistment. There may be more added to this list so check with your recruiter to see what other ratings may qualify. Recruits must show the required proficiency in a language where the Navy designates a need. This list changes occasionally, but there has been demand for Middle Eastern languages such as Pashtu, Afghan, Arabic (numerous dialects), Punjabi, Hindi, and Farsi in recent years. Again, it's best to consult a Navy recruiter for the most updated list. Applicants who enlist in special operations and special warfare programs and achieve an advanced score on the applicable physical screening test (PST) during basic training will receive a $2,000 bonus upon graduation from basic training. The ratings that qualify for this bonus include explosive ordnance disposal technicians (EOD); Navy divers (ND); and special warfare operator (SO). If the sailor washes out of training, they will retain this bonus. However, if they make it through training their regular enlistment bonus will be reduced by the amount of the PST bonus. It's important to be aware that if a recruit doesn't fulfill the terms of their enlistment for which they received a bonus, they will be required to pay the Navy back. The amount will be prorated and will depend on how much service time is left in the sailor's contract.